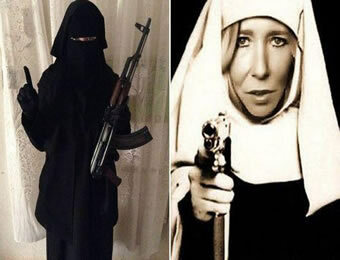 Sally Jones, the British woman who fled to ISIS-held territory with her young son, is training foreign fighters to execute attacks in English-speaking countries, it was claimed last night. Jones, a former punk rocker, has become one of the world’s most wanted female terrorists after leaving Kent in 2013 to marry late ISIS fighter Junaid Hussain. In a new development, she has been entrusted with leading the secretive female wing of the Anwar al-Awlaki battalion which is composed of English speaking fighters, Mail Online said sources told the Daily Telegraph. The unit is tasked with planning and carrying out attacks in English-speaking countries and teaches women how to use weapons, fight and carry out suicide missions. A Syrian ISIS defector, living near Gaziantep, said: “ISIS respects her because she is the widow of Junaid, who was very important to the group. There has been widespread concern that her 11-year-old son Joe, known as Jo-Jo, has been desensitised to violence amid several reports that he has appeared in propaganda videos. An activist also claimed that Joe was being lined up to replace British born executioner Mohammed Emwazi, known as ‘Jihadi John’. The activist added that Miss Jones has already enrolled Joe at a camp for boys which teach children ISIS’s interpretation of sharia as well as how to use weapons so they can one day join fighters on the battlefield. Jones’ husband was killed by an American drone in 2015 and it is thought she receives a monthly salary from ISIS of £520, plus a bonus of more than £200 every couple of months for being the widow of a ‘shahid’ or martyr. Last week French police foiled an attack in central Paris, which they claimed was planned by Europe’s first all-female ISIS cell. Led by 19-year-old Ines Madani three women were arrested after a car filled with gas cylinders was found near the Nortre Dame cathedral. Miss Madani had been stopped by intelligence services on various occasion from trying to travel to Syria. Prosecutor Francois Molins said the cell was being guided by Isis in Syria that which ‘intends to make women into fighters’, although it is not yet clear if there is a direct link with Miss Jones.